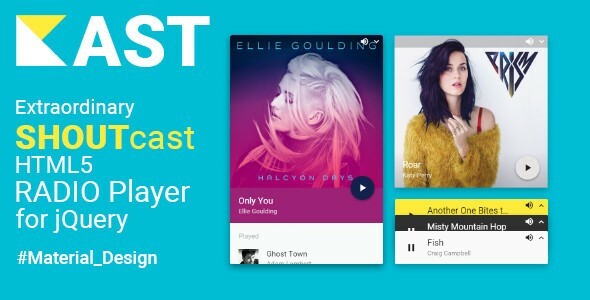 Kast - Extraordinary SHOUTcast HTML5 Radio Player for jQuery - Material Design - CODELISTPRO | Free Premium Scripts, Plugins, Apps Source Code. Kast – Extraordinary SHOUTcast HTML5 Sticky Radio Player for your website (jQuery and Zepto Plugin). Allows you to stream your live radio station to your web visitors on Desktops, Tablets and Mobile devices. SHOUTcast exclusive, Colorful, Responsive design, Fully-customizable, Production-ready, Mobile-compatible, Touch-friendly, Retina-ready and more. Following Google’s Material Design guidelines.